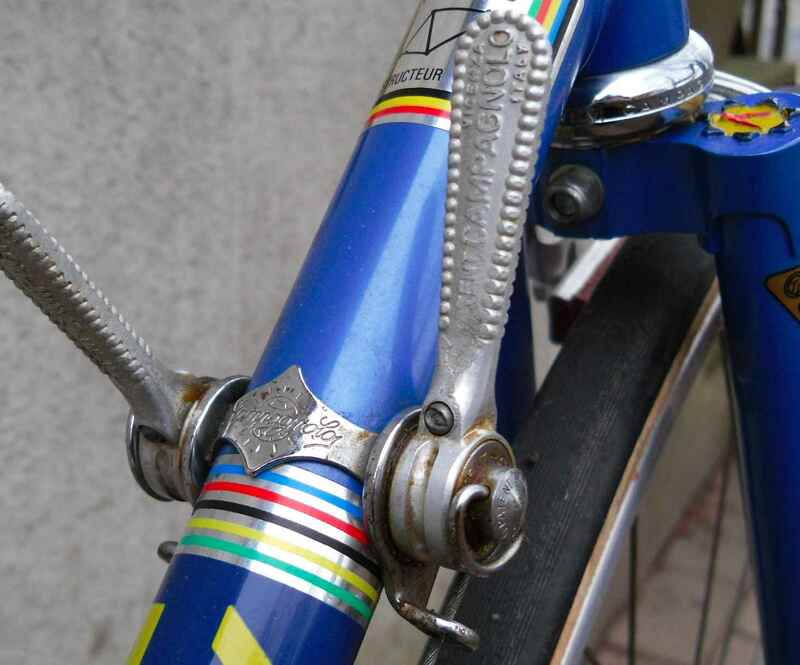 It´s not easy to find info on early Eddy Merckx labeled bikes, that is what many people who have written on the subject on the internet agree on. So it´s always nice to find a completely unmolested specimen, hardly used actually, to make more judgements from. 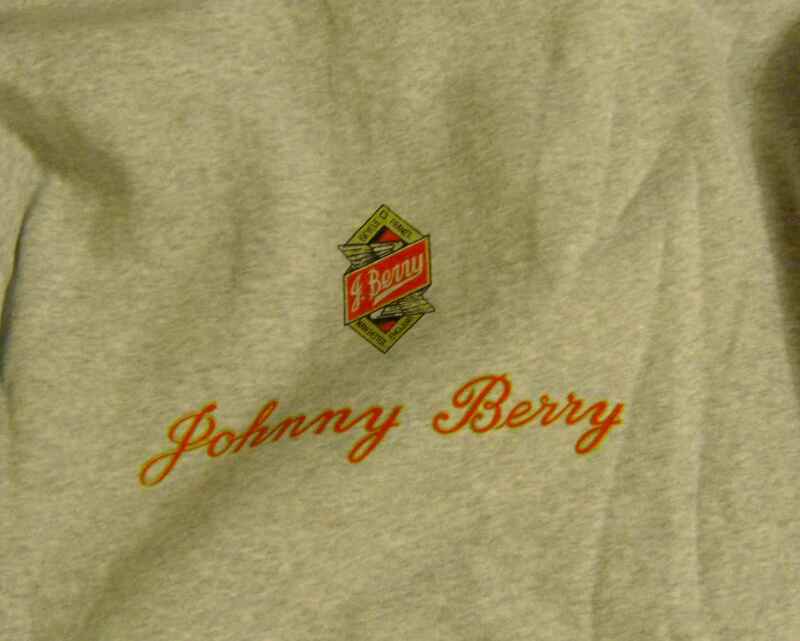 is the only place where any serious wear is recognizable. 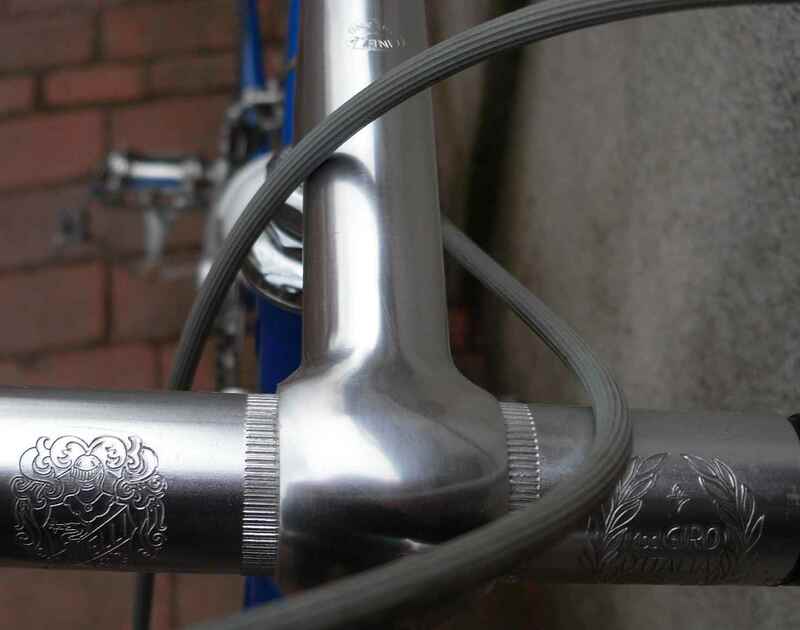 Some research on the net reveals that the Merckx name was big business in the seventies, when this bike was made. 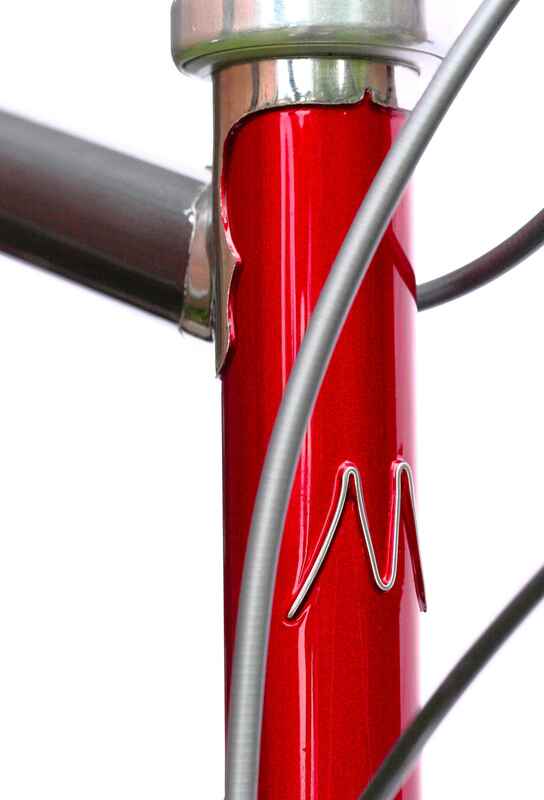 There were numerous makers licensed by Merckx to use his name, some consecutively, some actually at the same time. One of them was Ets. 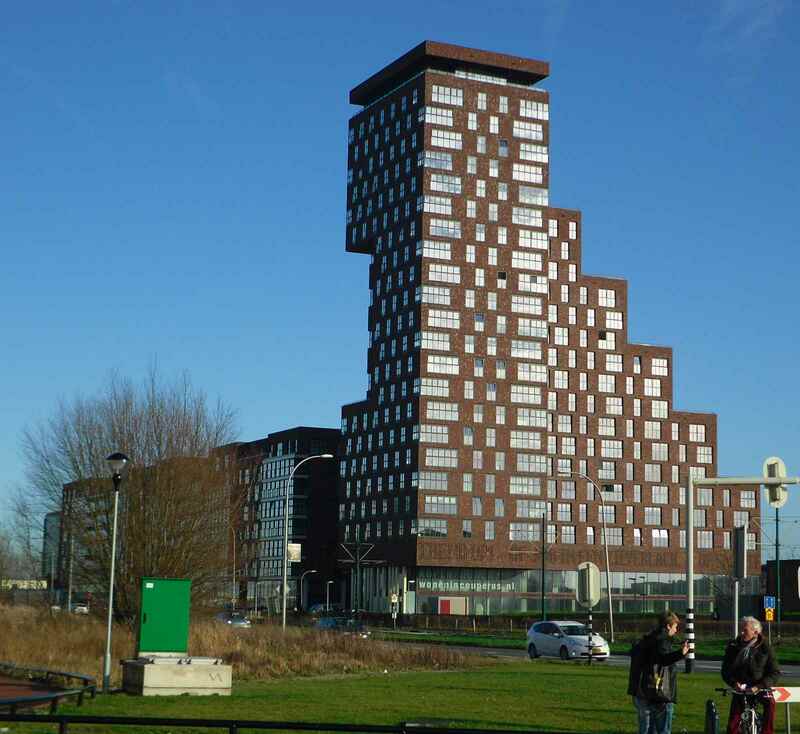 Kessels S.A. in Oostende, Belgium. 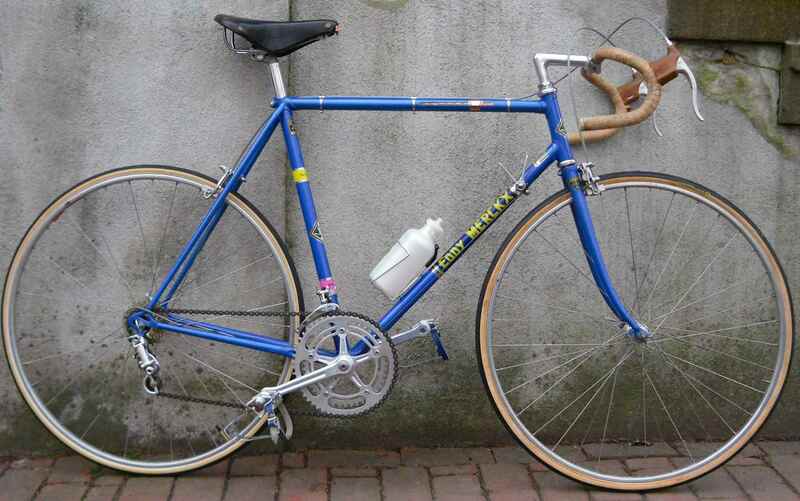 From what one reads on the net, they made a range of Merckx bikes when not selling under their own brand name Main d´Or. 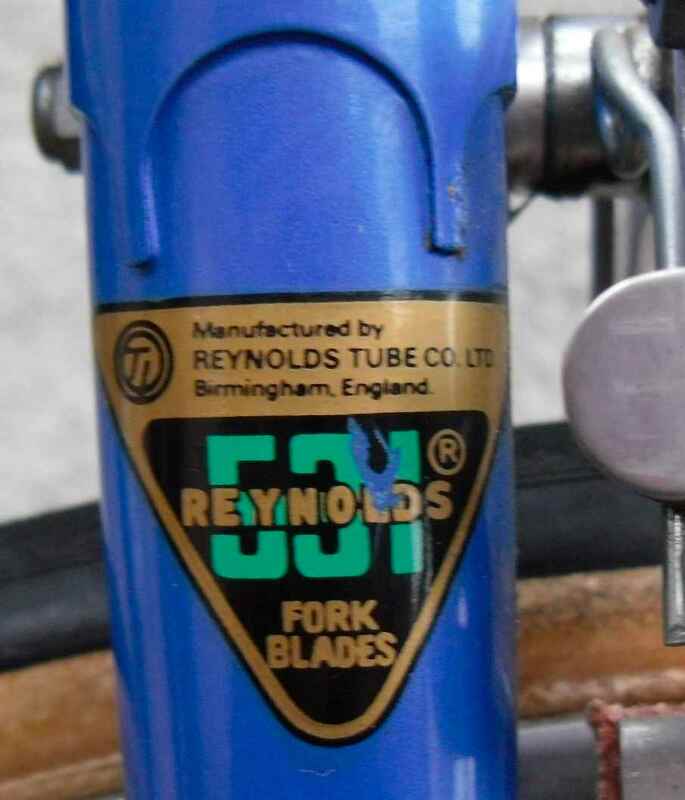 and the full 531 tube set. 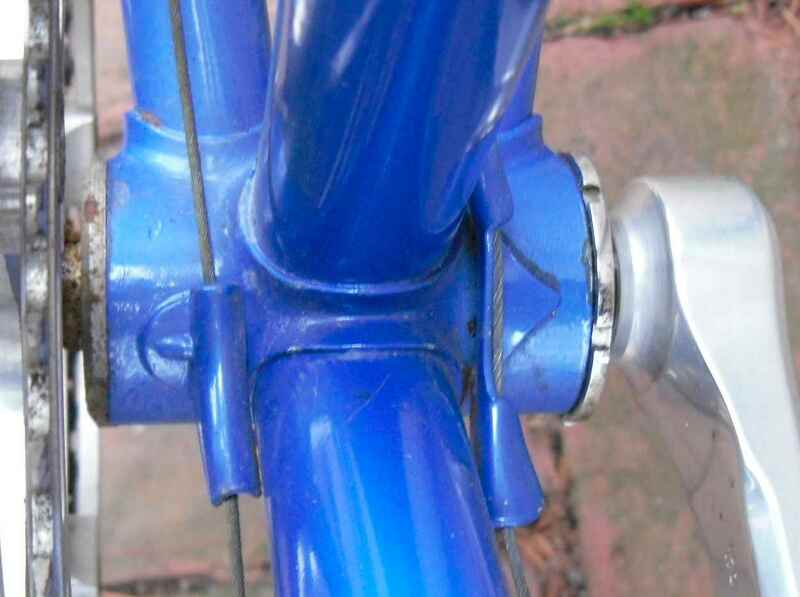 On the other hand the frame does not look as if it had been made very caringly. 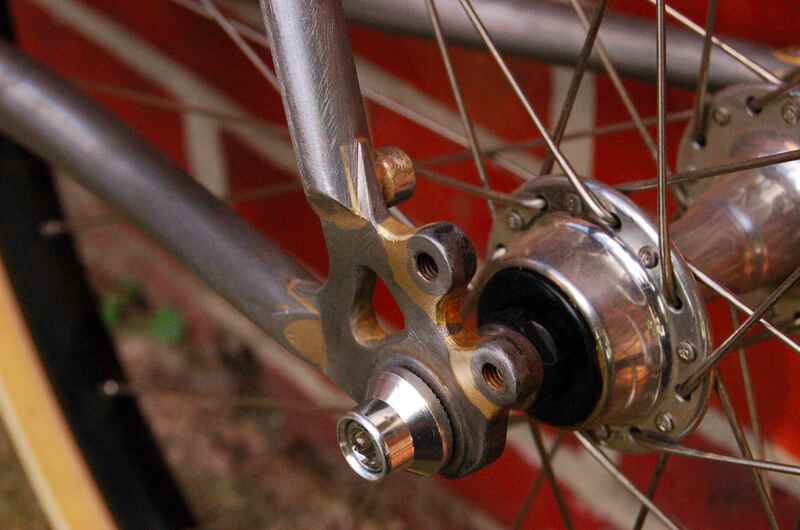 This seatcluster for example doesn´t exactly ooze quality, and these lugs have not received much attention, either. Also I´m not too sure about the forkcrown design. 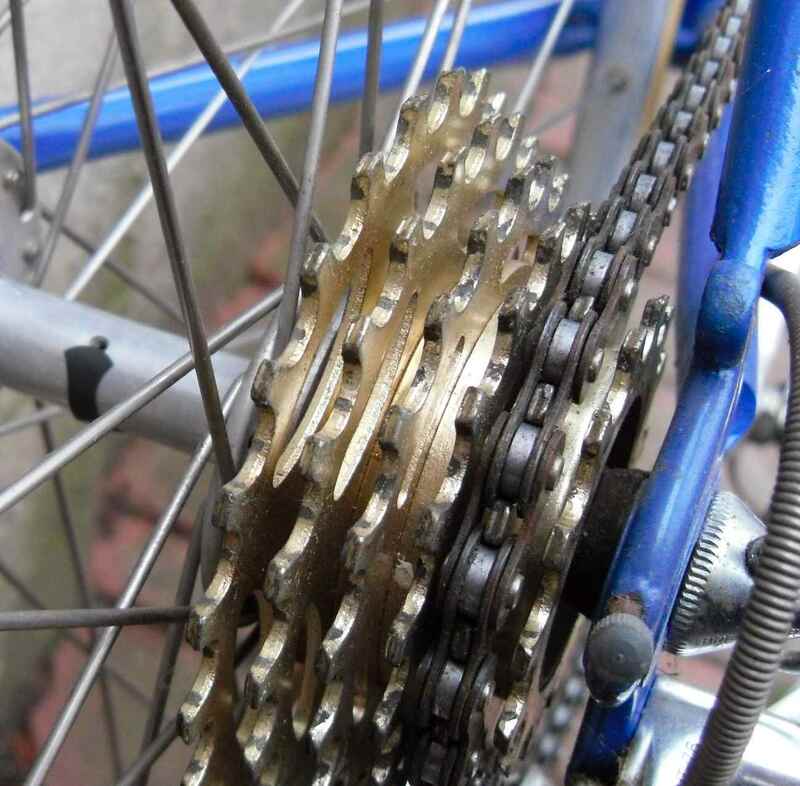 It does happen that especially lesser bikes carry numerous instances of their makers´ names. It is, however, a nice touch, and the crown seems to be cast. too. 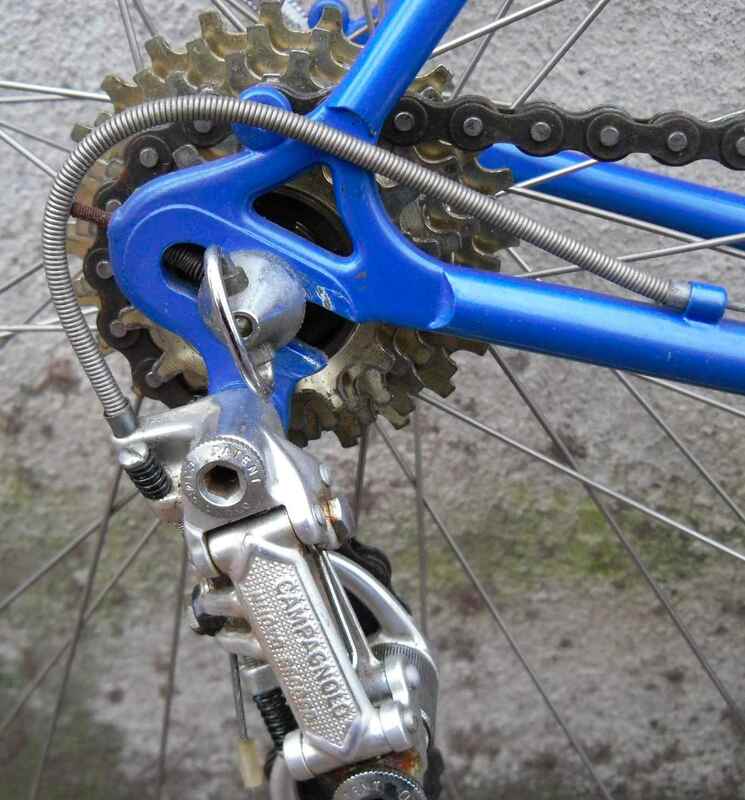 There are no braze ons at all, save the derailleur cable ones, for example over the b/b. 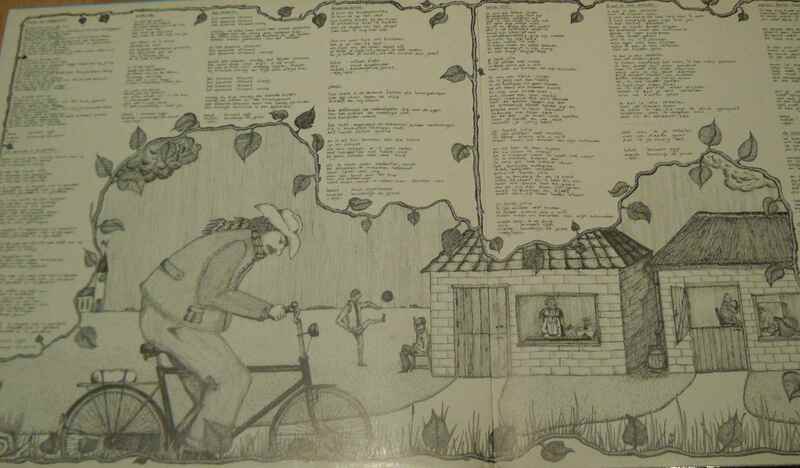 Everything else is band-on which of course might as well be a sign for the frame´s age rather than any lack in quality. Here´s the typical Kessels b/b shell, though, with some hand painted letters and numbers. 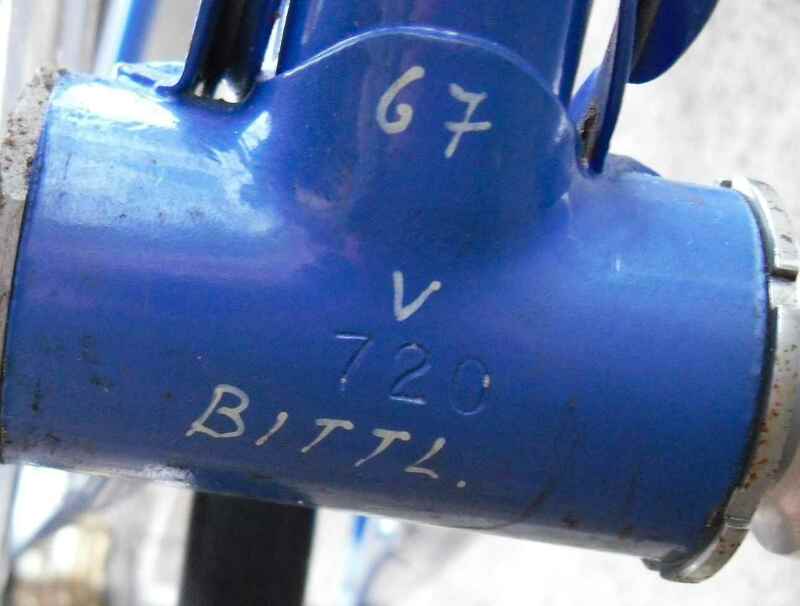 It seems to be clear now that the abbreviated name was the name of the shop which sold the bike, or the name of the first rider if the bike was bought direct. 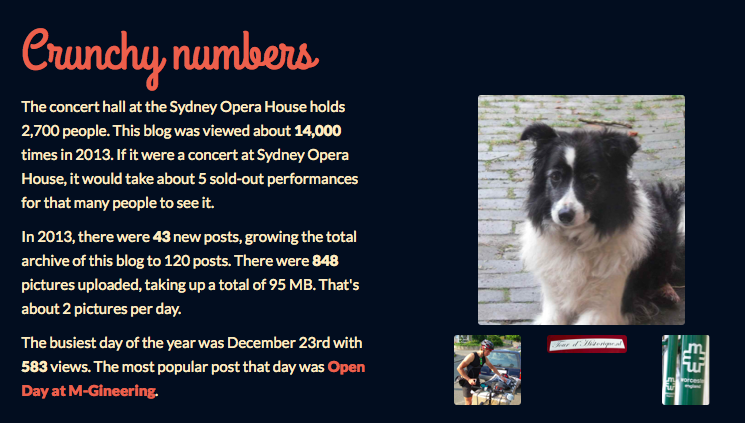 I found this info on the Flickr Group for Kessels, and it makes a lot of sense. 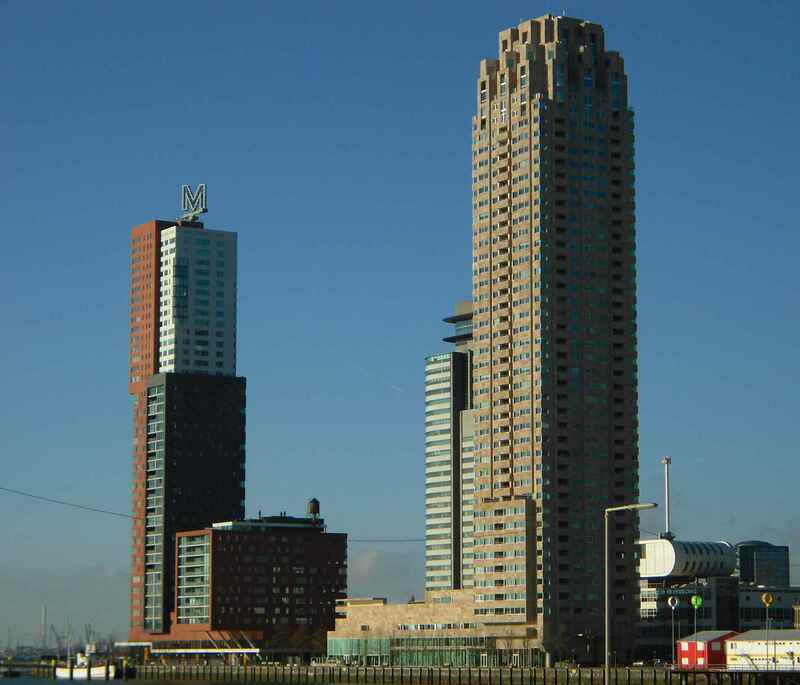 There is not a lot of information available online on Kessels. 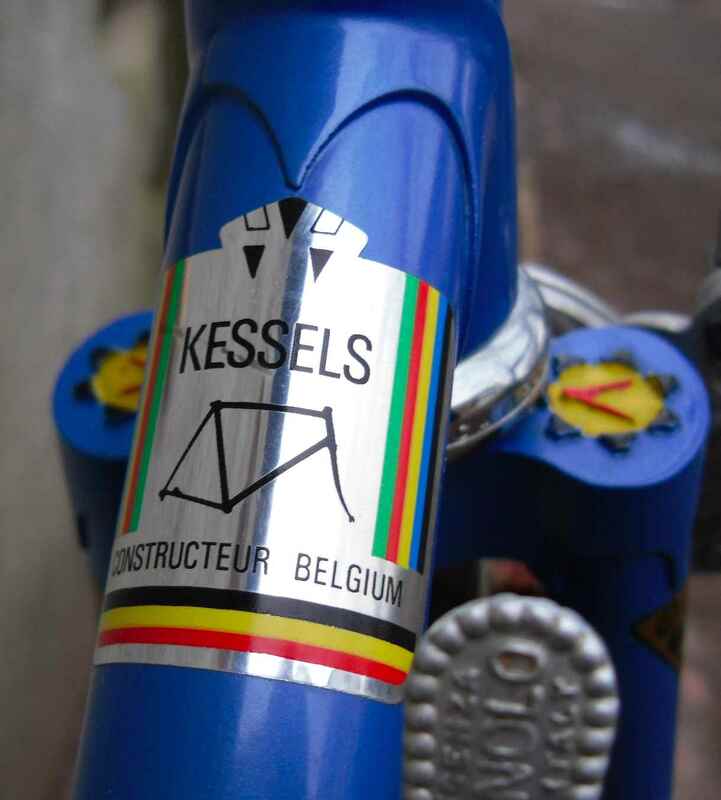 My own Kessels-built Merckx is, I think, top tier or close to it, and more in the ‘well-used’ category. 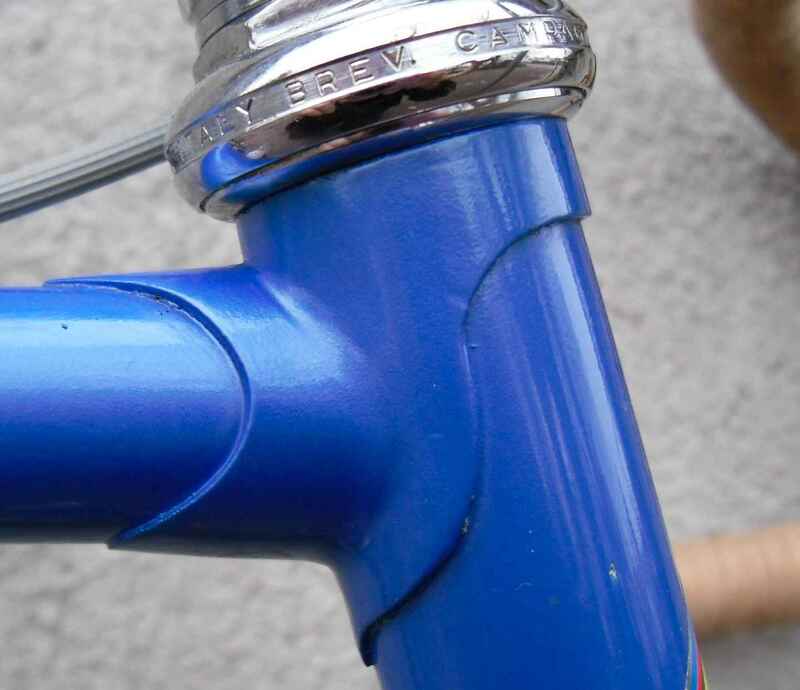 I was advised that the names under the BB denote the frame builder, not the customer. 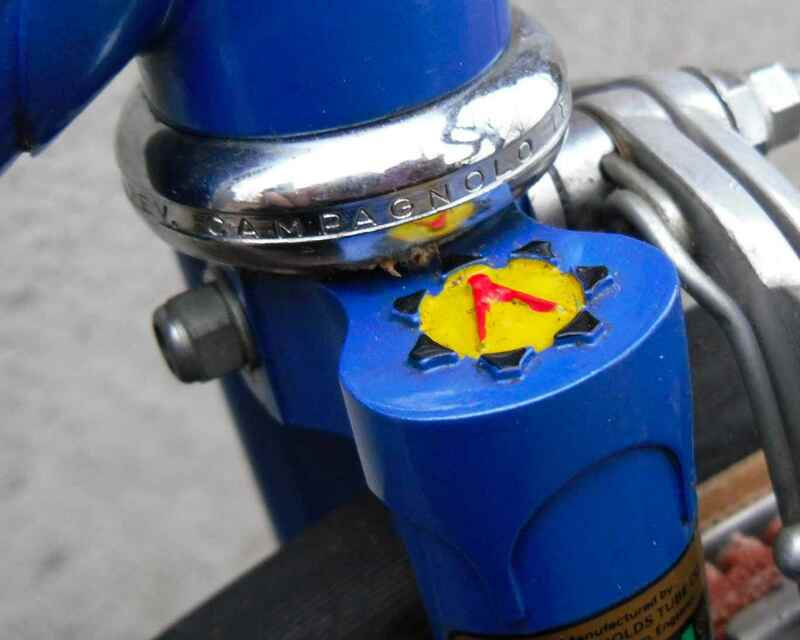 If the Pernod Trophy sticker on the blog bike is original, then it cannot be earlier than late 1974. 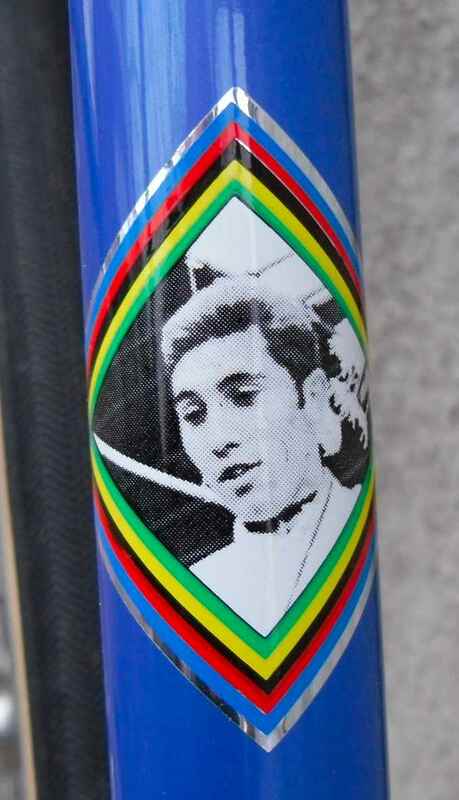 I also take that type of head tube decal to be a later style, whereas mine has a borderless picture, which would have had an Eddy above it to match the Merckx below it. 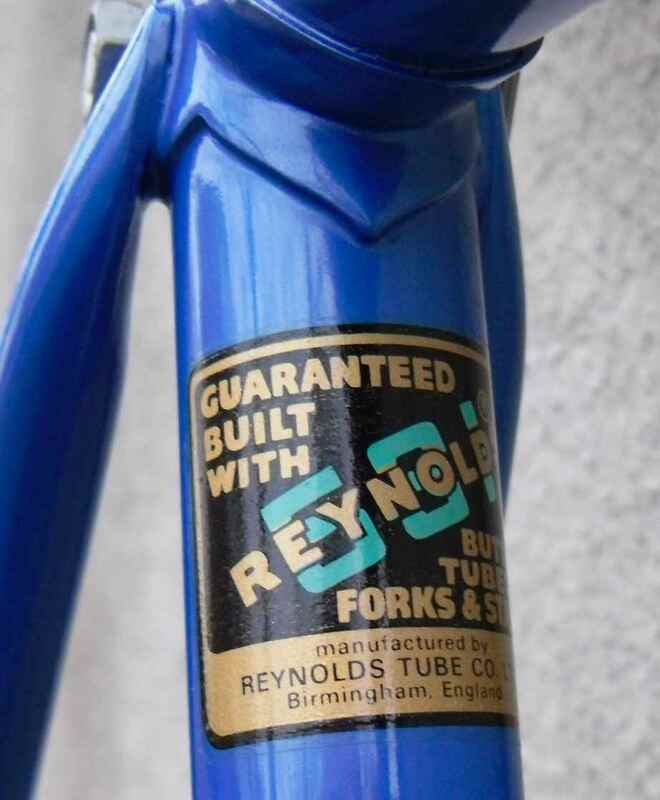 The seat tube decal though has a border. 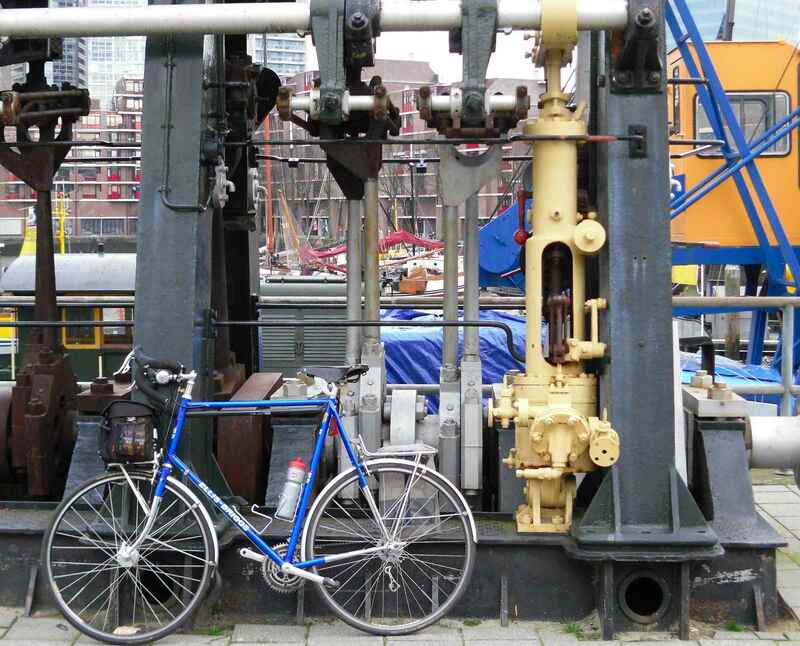 The blog bike is exceptionally well preserved. A very nice example with the same performance as the top tier models, just a slightly lower level of build and a small saving on components. 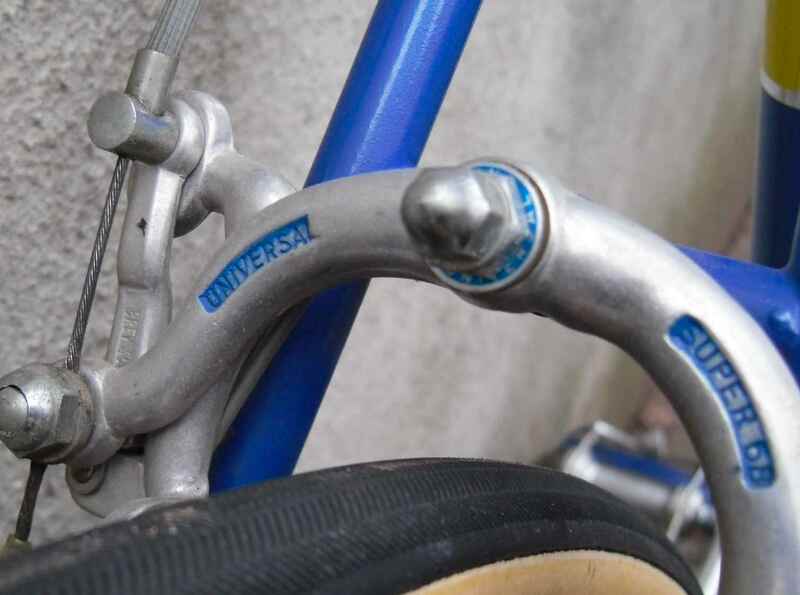 The colour of the Universal name goes well with the frame colour, but this is a coincidence. 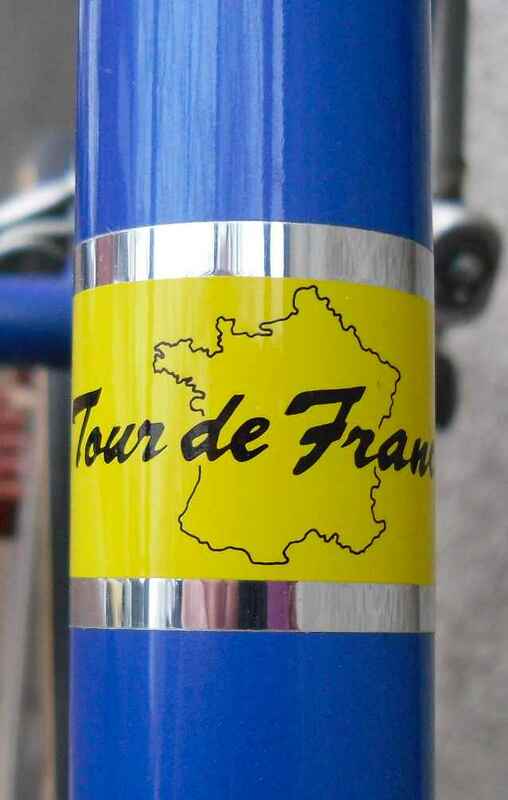 Here are some more pics of the really very well preserved foil stickers the frame abunds with. 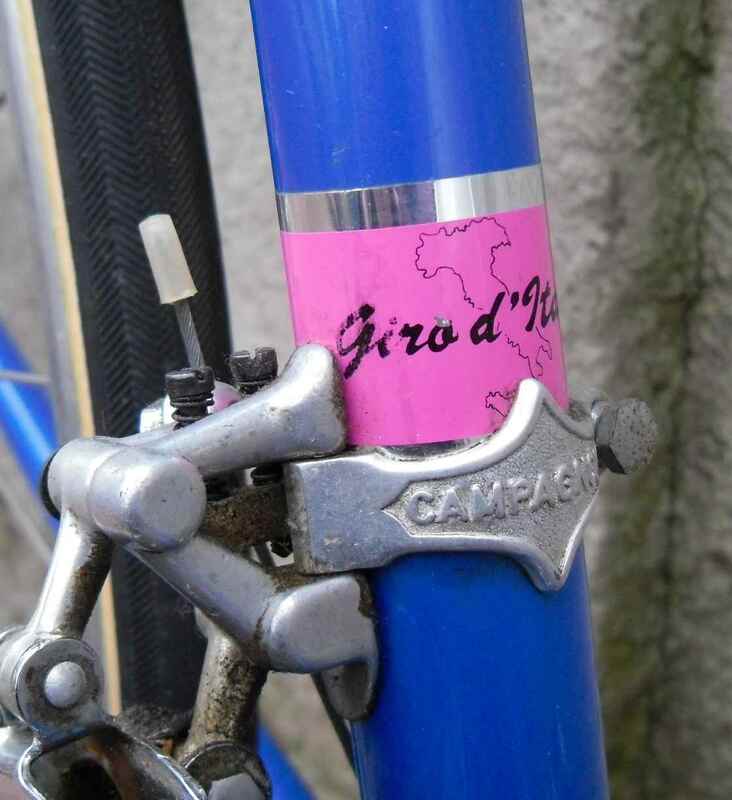 Did you note how the “Giro d´Italia” sticker near the front derailleur is pink, and this French language one is yellow? The jerseys, it seems, are responsible for this. 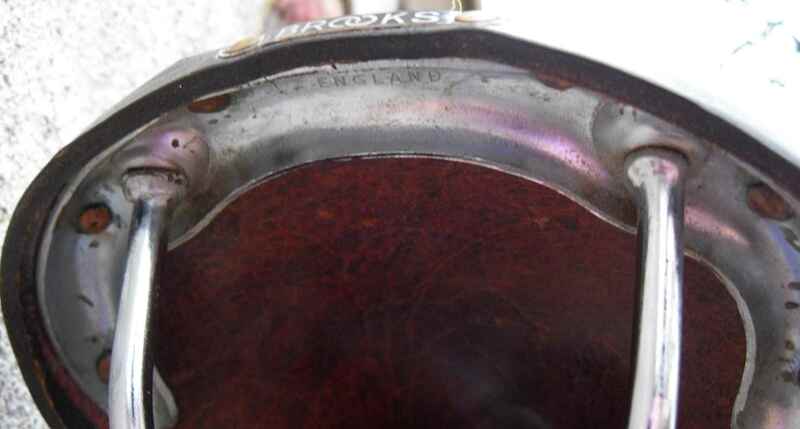 Lastly, here´s the Brooks Pro saddle, an item fitted by the current owner. 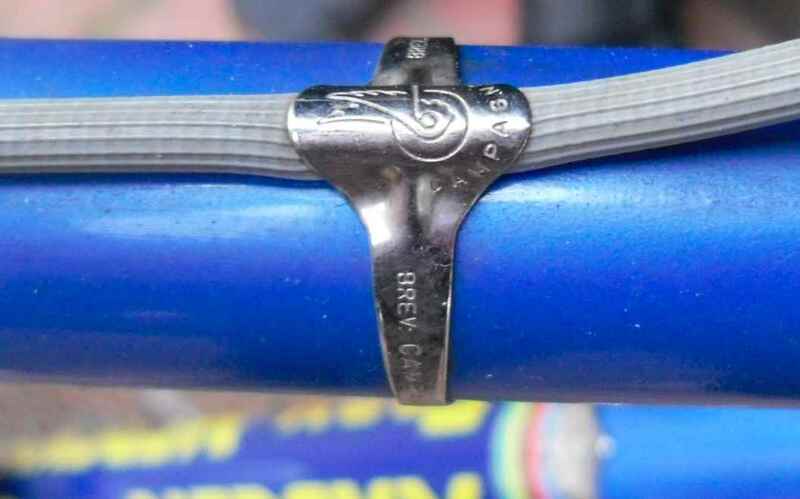 Two issues: One, I forgot to snap the places in which the Campag components are date stamped. I hope to able to do this soon. 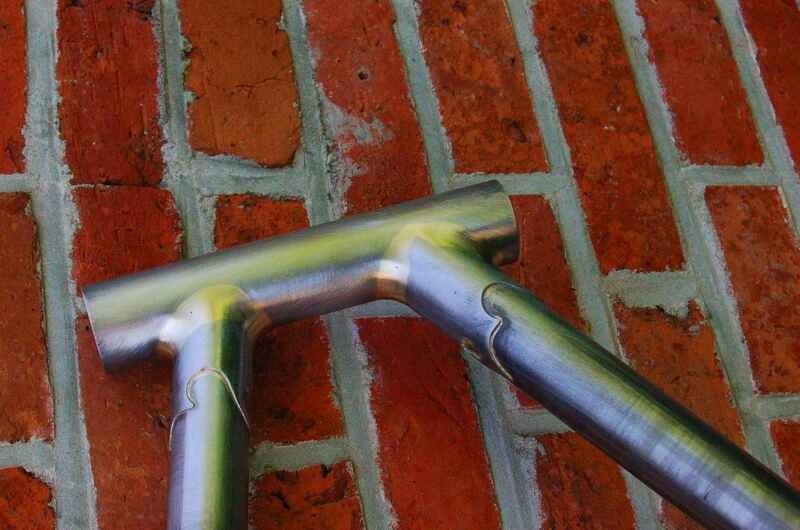 Second, the hasn´t been ridden yet, but this also is on the agenda. 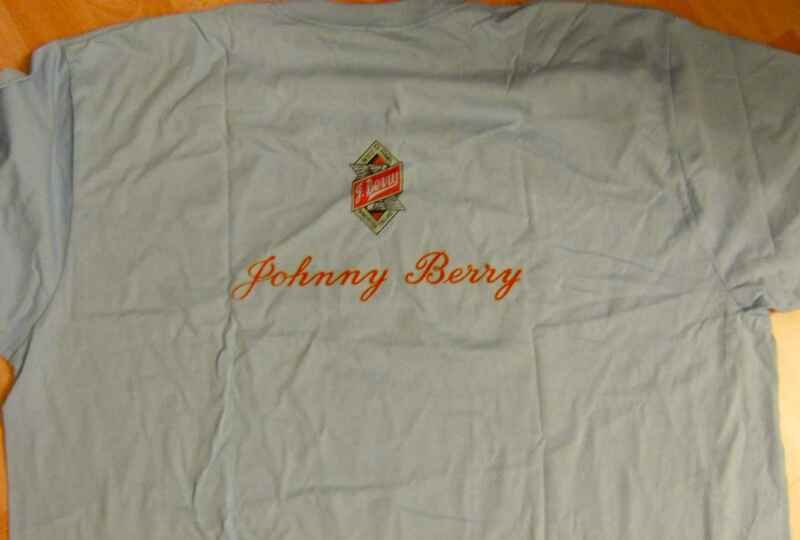 Some time ago, a member of the Classicrendezvous mailing list kindly offered to have T-Shirts printed with the Johnny Berry logo, for which he had received the placet by the Berry family. 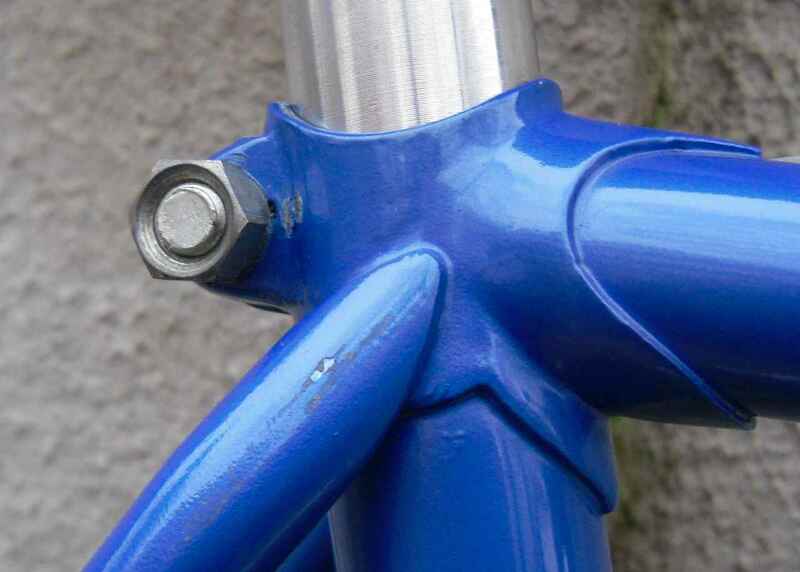 I really needed to have one as Berry is my favourite frame maker (https://starostneradost.wordpress.com/2012/02/01/by-special-request/), together with Ellis Briggs, M-Gineering and a few also ran – others. This nick of the woods being somewhat printed T-Shirt unfriendly because you can only wear them visibly for a few days each year, I asked if a hoodie would also be doable – it was. 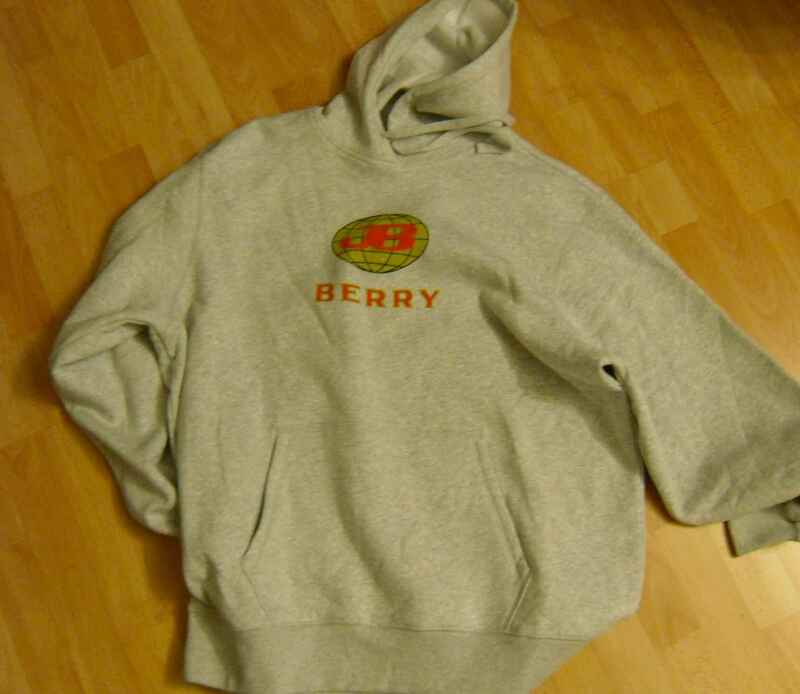 So if you also feel you need to have a Berry merchandising article, drop me a line via the comments, and I´ll pass the message on. Here´s the magic wand again, and I´m back to my regularly scheduled programme. 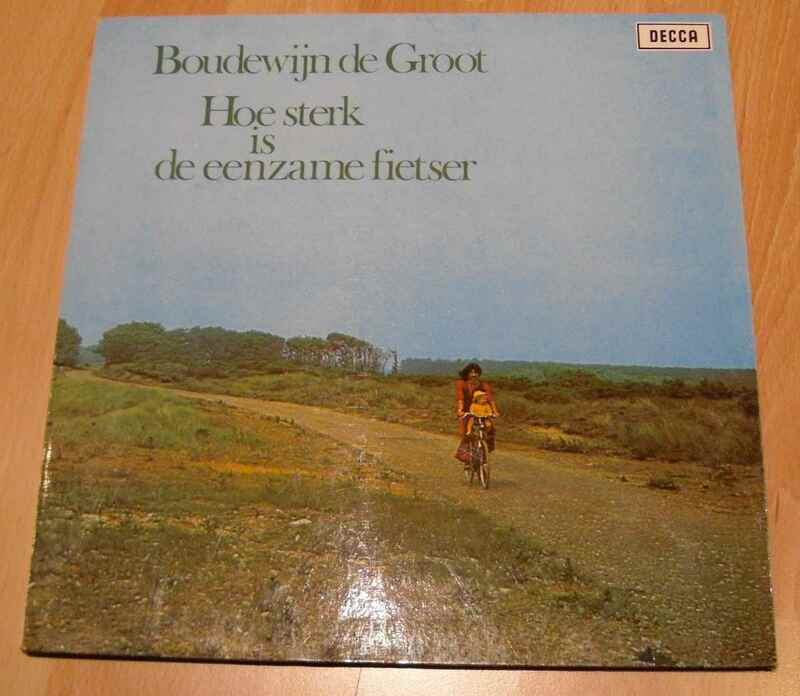 Here is another cyclist, head bent down, obviously battling a headwind. 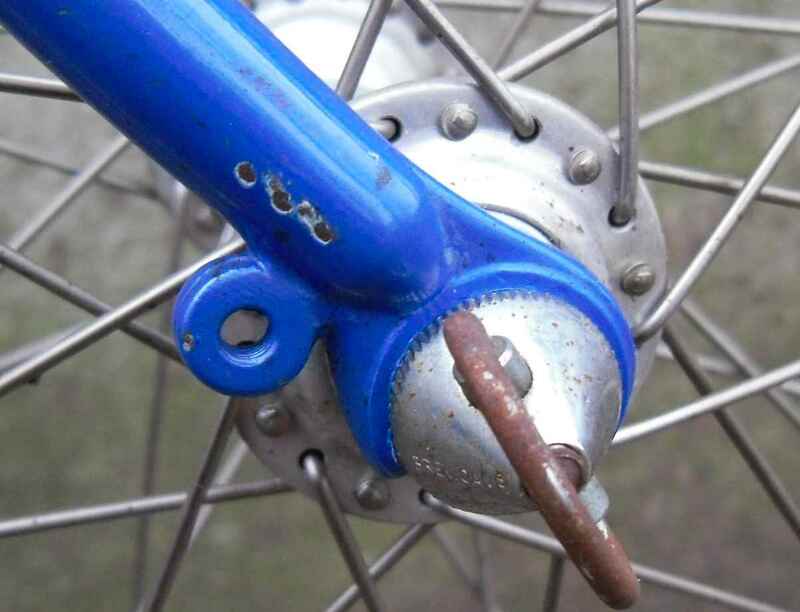 Don´t we all know the feeling. 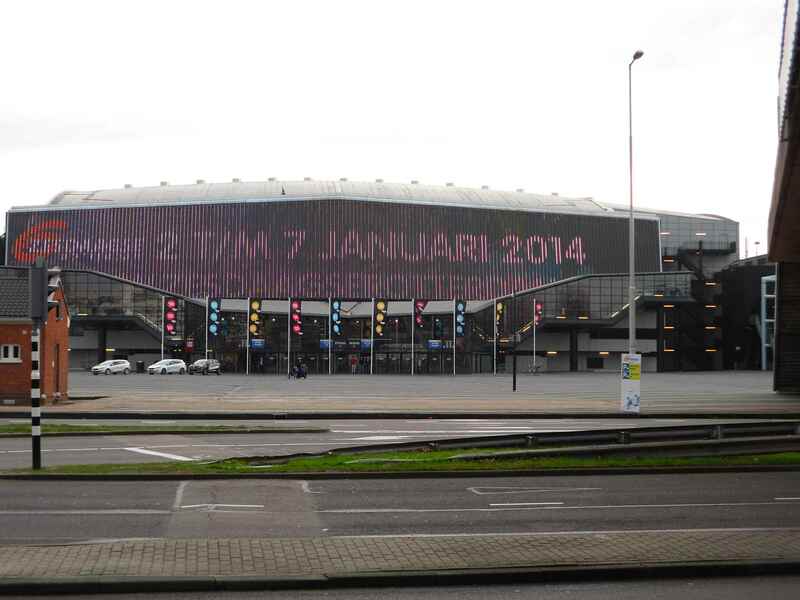 The Rotterdam Sixdays… From January 2nd to 7th, 2014. 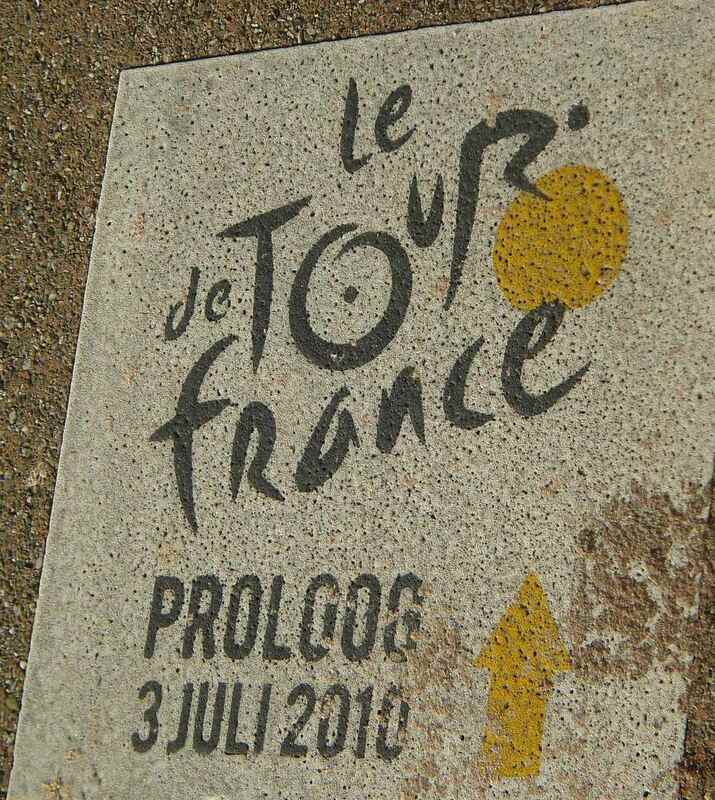 I nearly overlooked the markings on the cyclepaths. 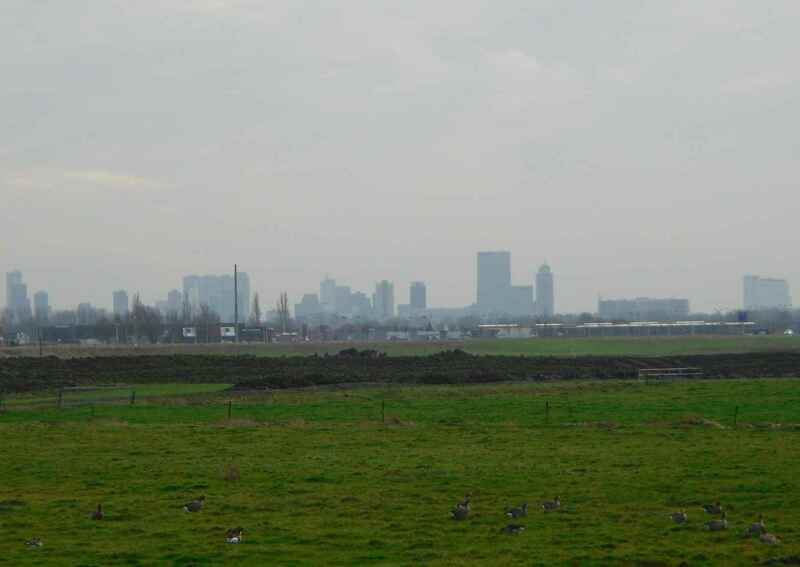 Some minutes later, I had left the bustling city behind me and could start cycling for real – the first outing this year. 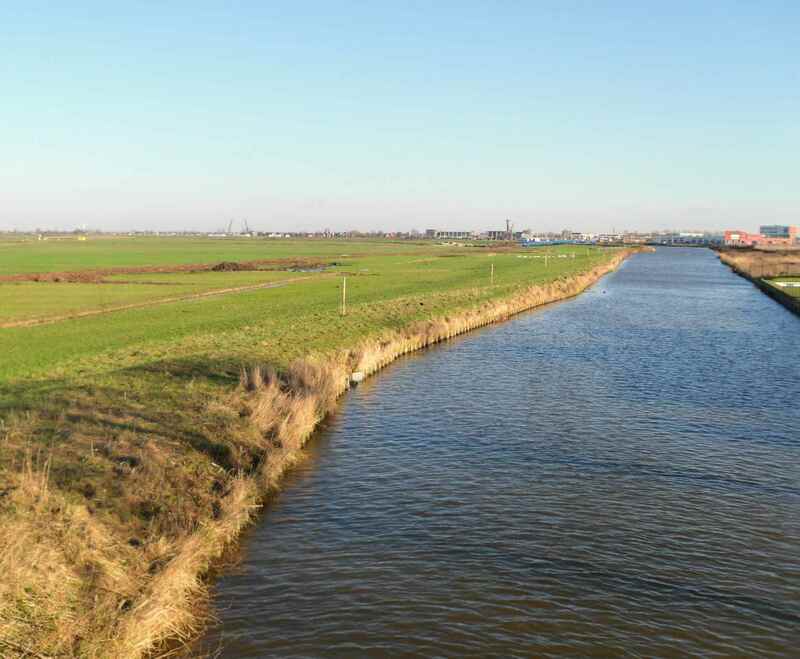 You can´t call this Dutch landscape spectacular at first sight, but if you look closely, what you can make out is that most canals actually are above the level of the fields – and both are below sea level. This landscape is wholly man made, and as such it is spectacular after all. 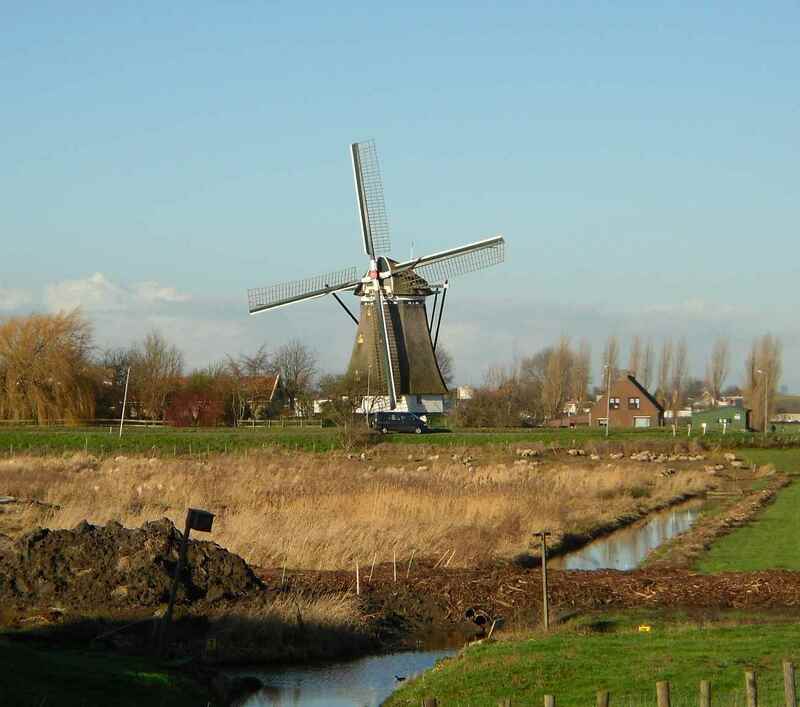 The infrastructure behind this system is huge – locks, pumping stations, dams, canals. 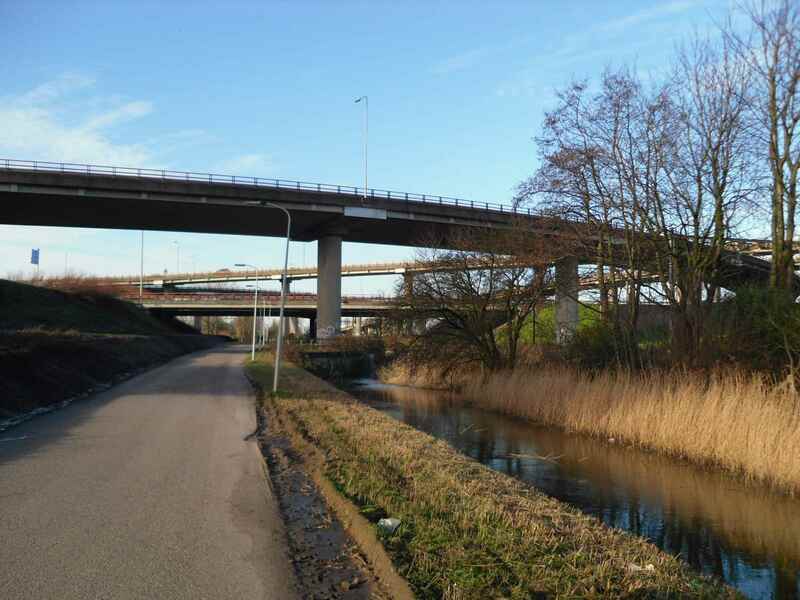 The authority looking after the security of canals, roads and the railways is called Rijkswaterstaat – the canal system giving the name to the whole Dutch traffic authority which prides itself to ensure “dry feet, clean water and speedy traffic” – again in this order. 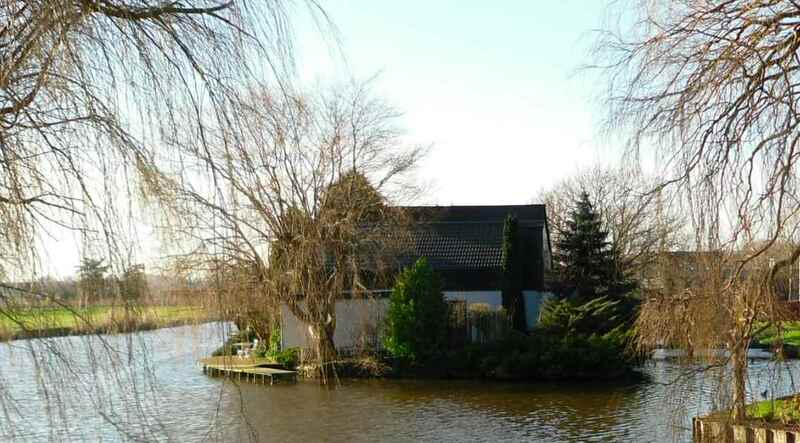 There´s water everywhere, and people don´t just live with it, some seem to live in it. 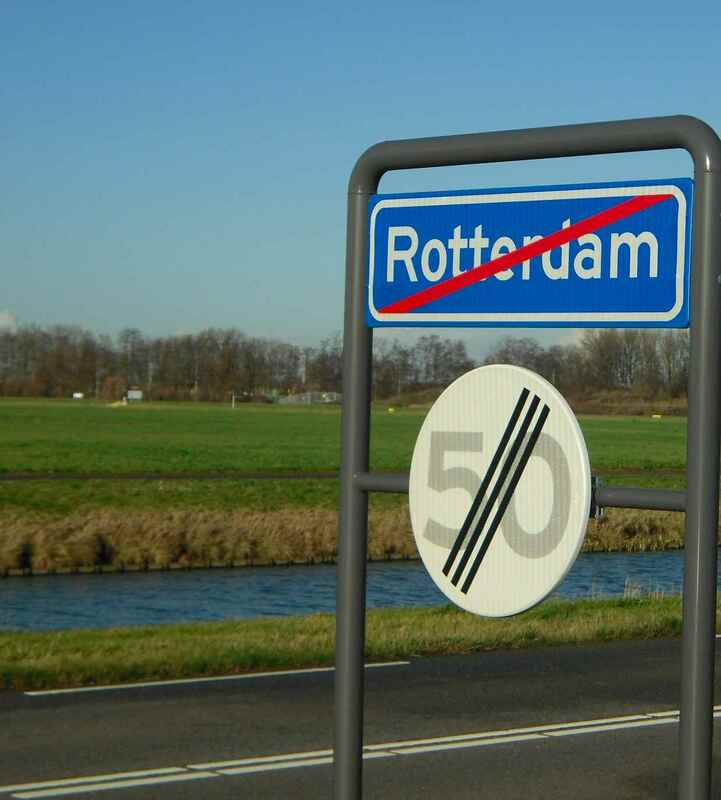 It says Through Traffic, meaning of course that the Dutch use their bikes for relatively long distances. 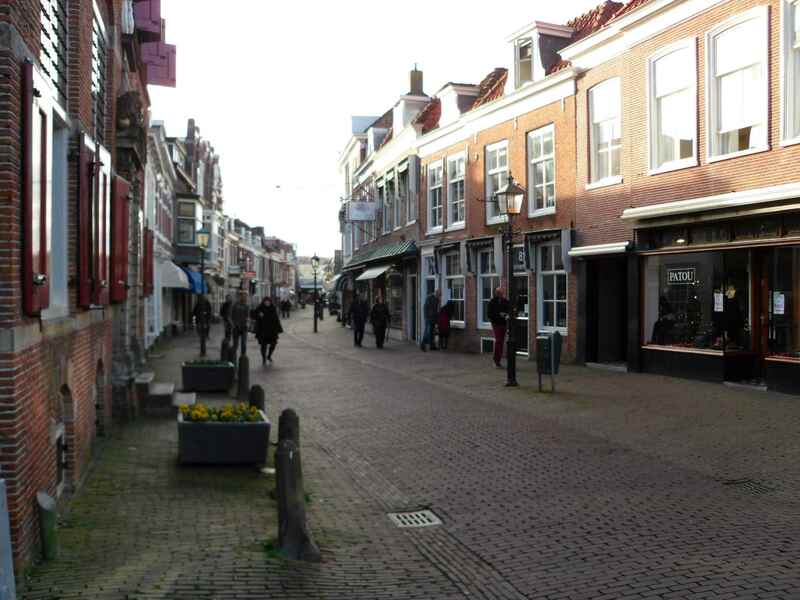 And then you´re there: A typical Dutch town of which I can never get enough. Oozing history and good life, somehow. 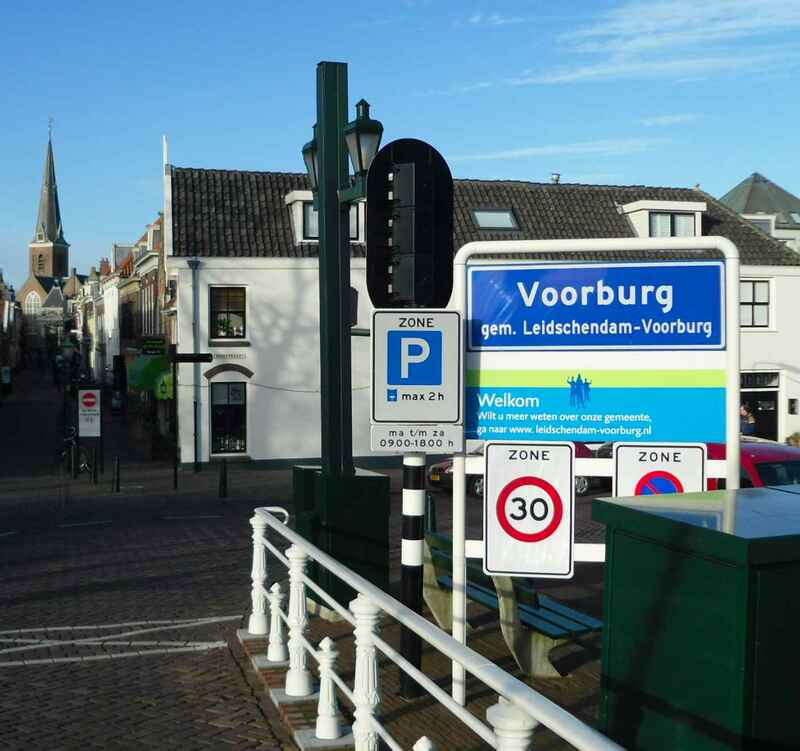 I don´t know if I´m alone in this, but I still feel quite privileged to be able to just go and visit – no visa, not even a passport control on the border, the same currency, friendly people showing me the way. 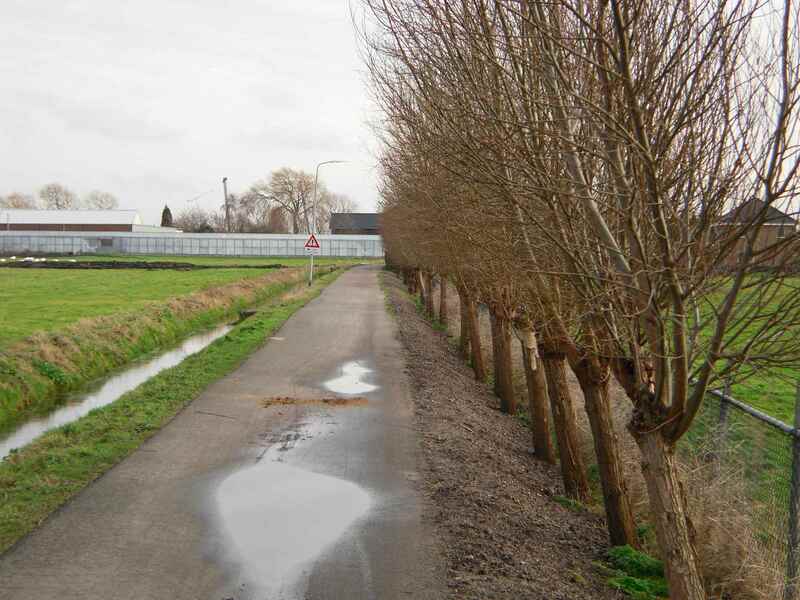 Just hopping on their bikes and enjoying a ride in Holland isn´t something my grandparents could have done, so I think I should feel grateful that I can, and I do. 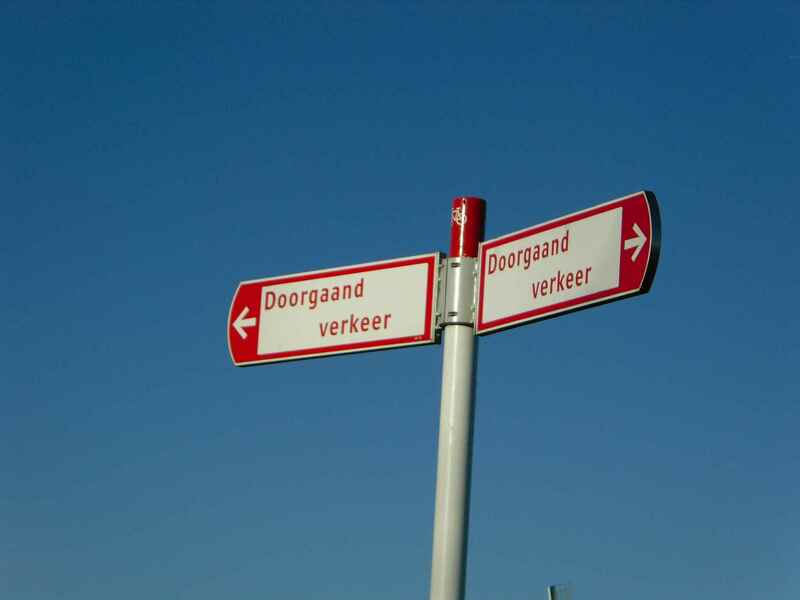 Dutch is a language I really like and try to speak acceptably. Sometimes my English gets in the way, though. 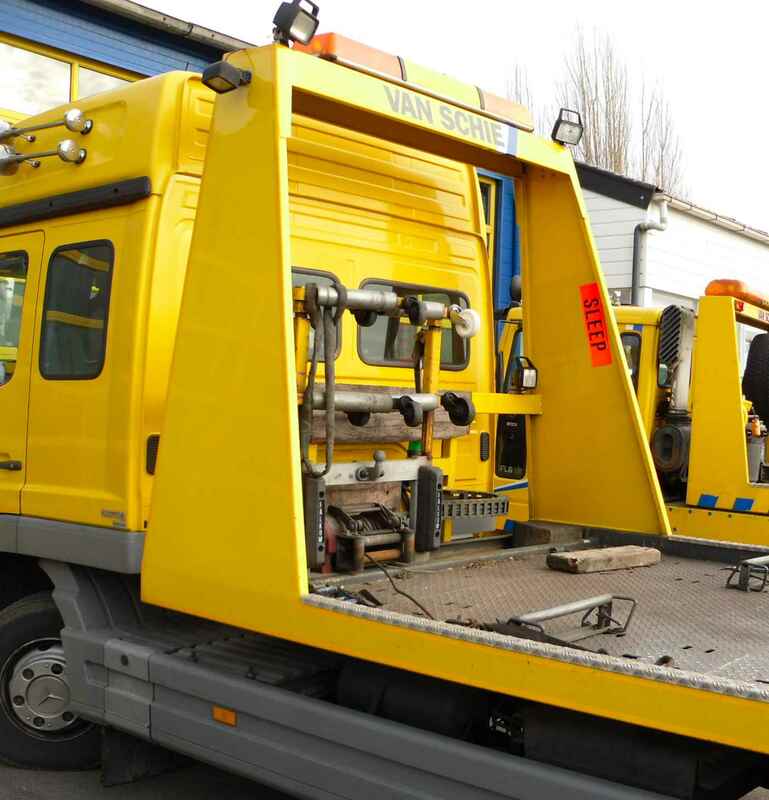 The little orange sign of course doesn´t mean that the driver is having a snooze, but it is attached to a vehicle being “on tow”. 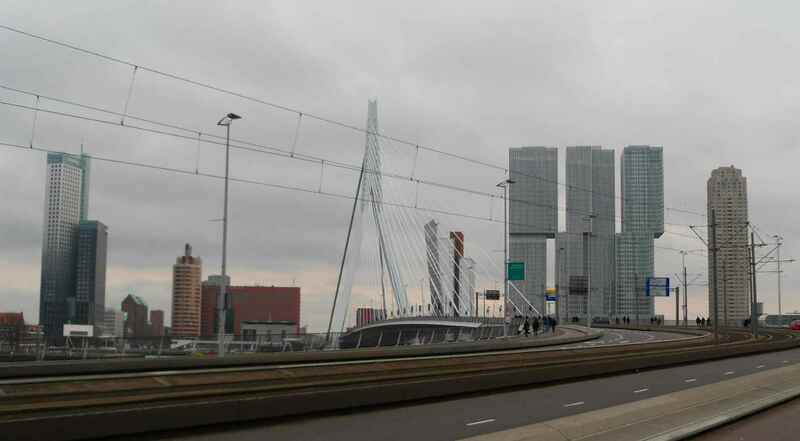 Soon I was nearing Rotterdam again, and had a minute or two to look at this magnificent roundabout. 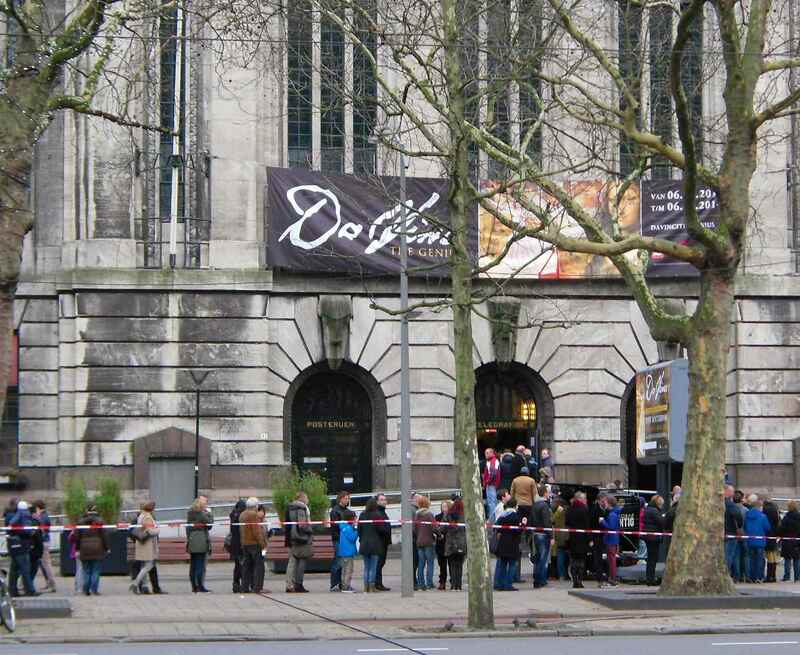 It being a Sunday, many Rotterdammers had the leisure to visit the Da Vinci Exposition in the former post office on Coolsingel. Two spectacular things were waiting for me still. 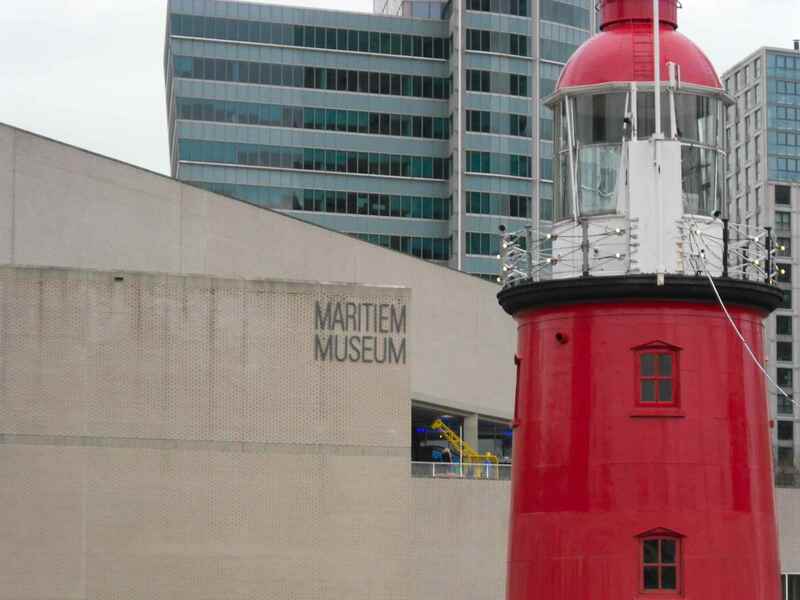 First, the Maritiem Museum, with a lot of colourful outside exhibitions. 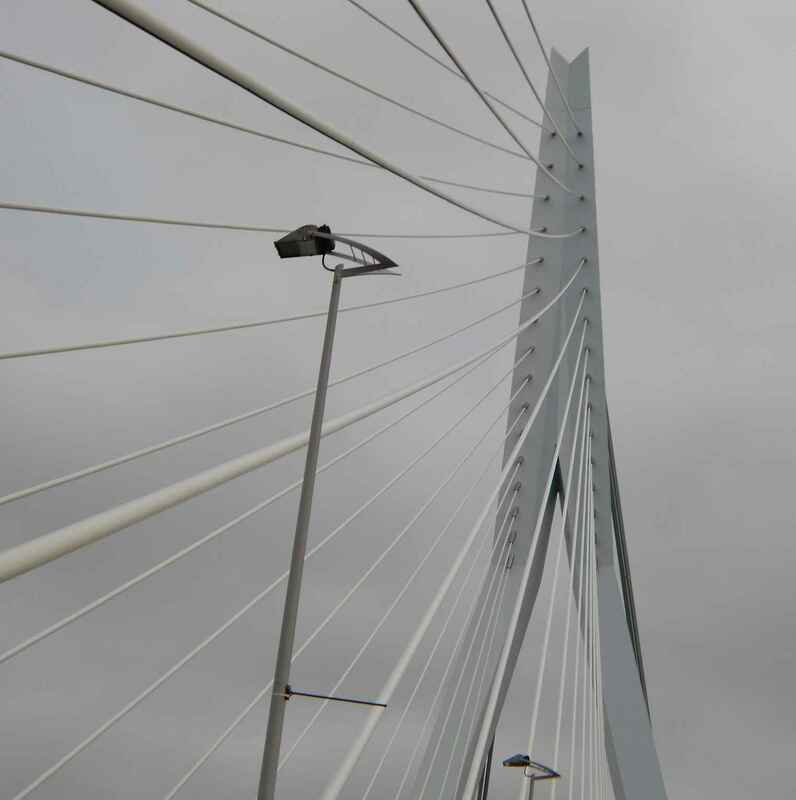 In the third photo, the second attraction is already visible: The cable stayed Erasmus bridge. 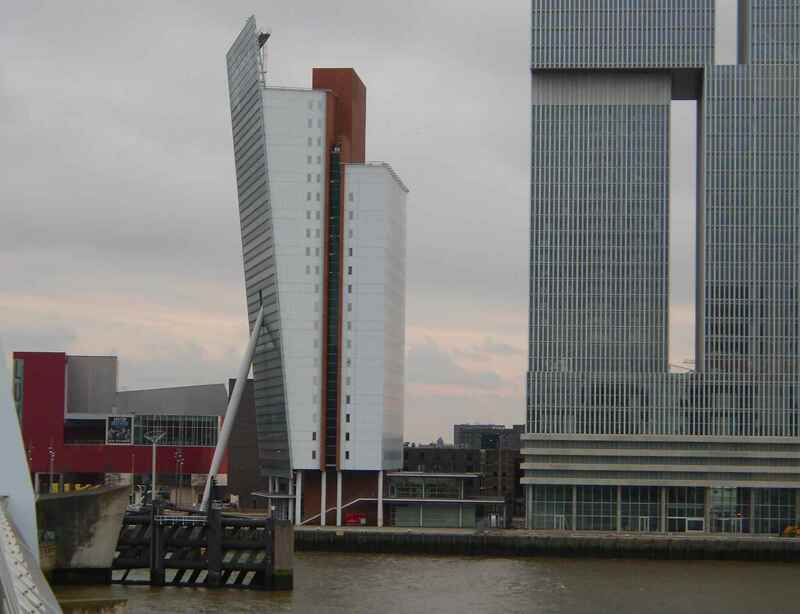 Named after one of Rotterdam´s most famous sons, it was opened in 1996 and has since been nicknamed “the swan”. The high rises flanking it make the whole ensemble absolutely worth a visit. 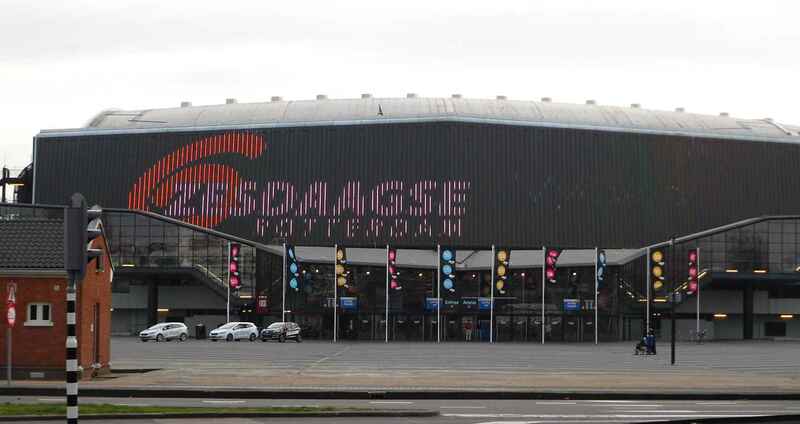 Soon I was back at the Ahoy, arriving at the car park within a minute of my son. He said that he had had some spectacular opportunities of capturing track racing (which will appear on your tube sooner or later), but I was glad I had chosen my lonely ride. First, of course, a happy new year to you all. And I think I can say this now, „you all“, as there are more and more of you, which I find flattering. and laced with facts and figures. 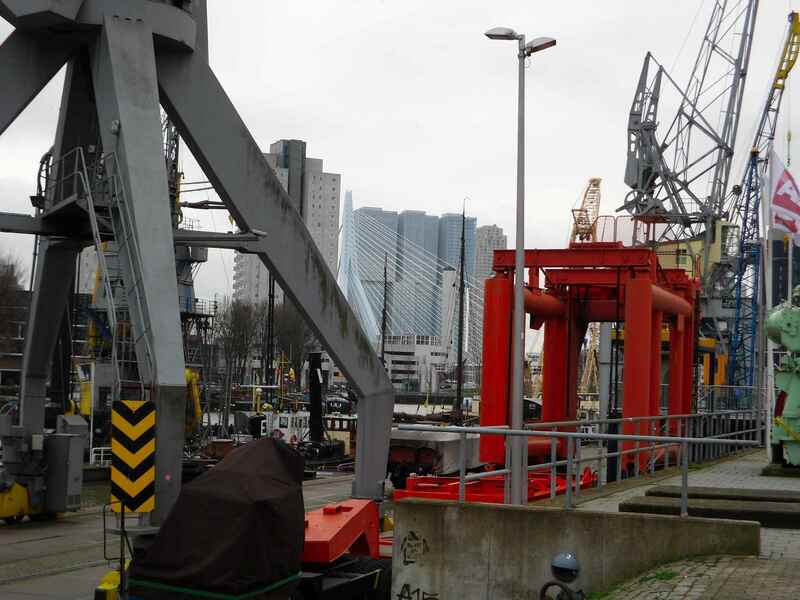 There is now an average 1,000 views per month, reckoned over the 23 and a half months I´ve been blogging, meaning that there are less visitors, but as each visitor reads about two and a half posts, it´s still quite a crowd. I´m not doing anything re advertising my blog, like having accounts with all sorts of social media to propagate it, and I´m very sparse with tags, too. I like it this way, and I´m not going to change it. I´m not after high rates, because then I know that visitors mean it when they come, and even more so if they perhaps return. In 2013, viewers came from 81 countries, which I find amazing. Which Hungarian would want to read my musings? Who from Mongolia? In general I was just fascinated – until my son, who is very à la mode in all things internet – told me that these places are only where the servers are, not necessarily readers. However, I think I have a pretty good idea who my Thai reader might be, for instance. What I love about bogging is that I am allowed to stumble, to blindly find my way. 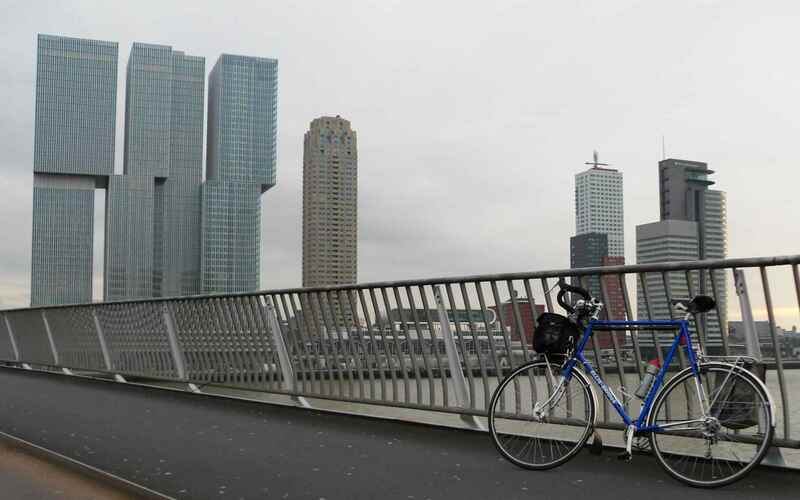 Would I have thought that the reports on the French cyclist riding from Copenhague to Paris would prove interesting for so many of you? Did I guess when writing about it that Marten Gerritsen´s Open Day would net the highest view rate in my nearly two years of blogging? No. Everywhere else we all need to be scientifically precise, innovative, and as perfect as possible – at work, else there´ll be trouble; in traffic, else you´ll get killed, and so on. Blogging is one of the few activities in which I don´t have to think about too many things, still people seem to appreciate what I´m doing, and I guess that´s why I´m feeling so flattered.